This medium height, front facing arrangement of flowers for office receptions, foyers, lobbies and boardrooms is designed using fresh green and clean white colours. With a focus on tropical flowers, our florist team use in-season blooms such as pineapple lilies, fresh fig branches, hydrangea and sculptural leaves and husks. 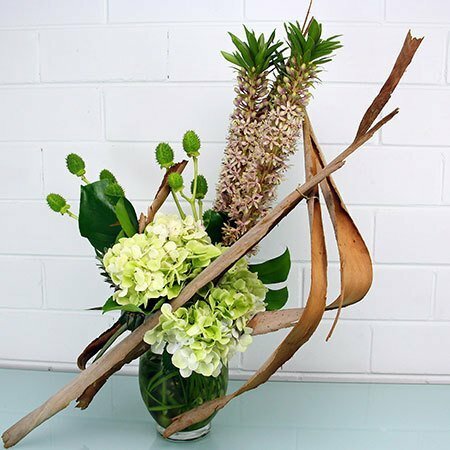 The specific flowers used in all our office vase arrangements are dependent on what is available and in season week-to-week, yet the overall design style and look remains consistent. *Please note: We recommend giving our team a call on 1800 66 66 46 to discuss your corporate flowers or email an enquiry to sales@flowersforeveryone.com.au and one of our florists will get in touch. Flowers for Everyone deliver flowers to offices throughout the Sydney metro on a weekly basis, and tailor your blooms to your office decor and budget.